The steps may make Philly look good at the NFL Draft, but it won’t be the Art Museum in the background when Roger Goodell begins announcing picks tonight. 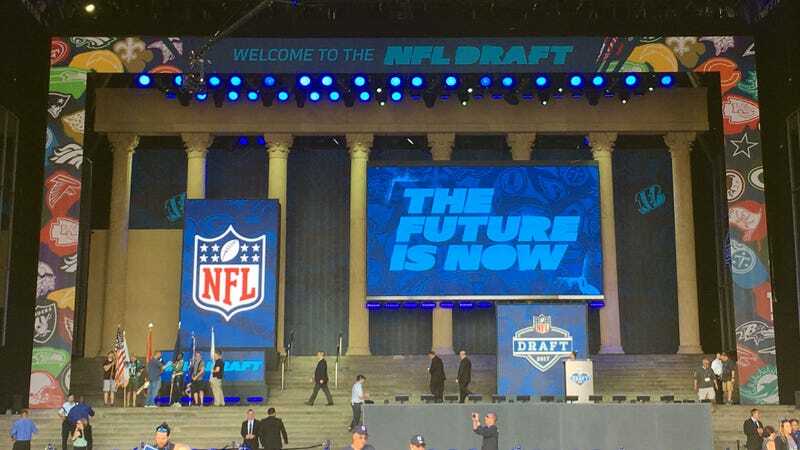 The NFL Draft stage is on the iconic Art Museum steps, the ones tourists run up to pretend they’re Rocky Balboa. But a quick run to the NFL Draft stage today showed it was, most certainly, a fake Art Museum backdrop. The plan is for the new draftees to walk down the Art Museum steps before shaking Goodell’s hand. But they won’t be replicating Rocky’s run. The foam Art Museum is only a short way up the steps. In summary: The NFL insisted on the Philadelphia Museum of Art for its draft venue, then constructed a fake Philadelphia Museum of Art anyway. The PMA did not immediately return a request for comment on the artistic value or quality of the fake art museum.